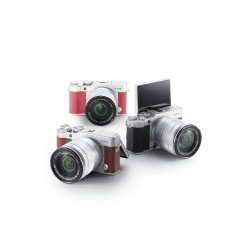 As a leader in advanced digital camera technology and outstanding image quality, FUJIFILM North America Corporation today announced the new FUJIFILM X-A3, a compact mirrorless camera with a large, 180 degree tilting touch LCD, eleven film simulations and ten advanced filters, all in a retro, classic design. When taking a selfie, users can focus and release the shutter by pressing the vertical command dial, found directly below your index finger that also minimizes camera shake. The new Self Timer function now offers Smile Detection, Buddy Timer and Group Timer modes. Even without having to press the command dial or release button, the shutter is released when subjects smile, when two people come close together, or when a specified number of people come into the frame. The X-A3 also automatically activates Eye Detection AF when the rear LCD is tilted upwards, and the Portrait Enhancer mode now offers three-step adjustments, using touchscreen operations. The addition of the skin-tone brightening function takes your portrait photography to a new level. NEW – Panorama and Time Lapse functions.